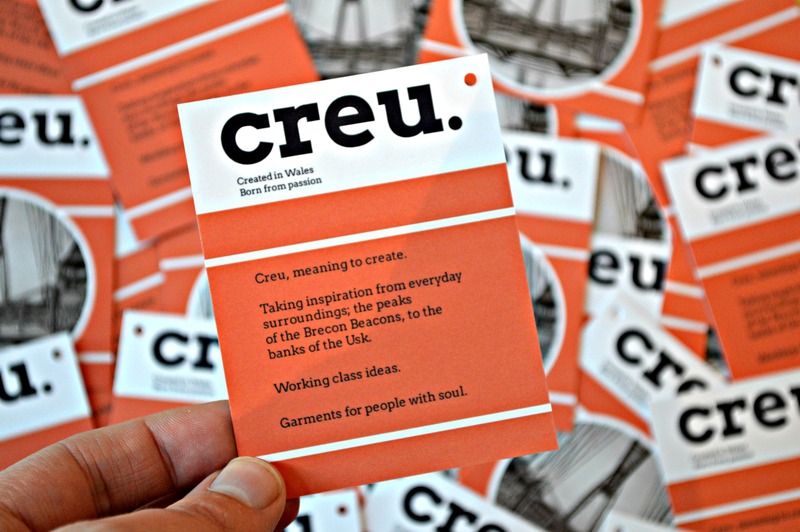 Don’t call it a comeback … this spring sees the launch of a new brand: Creu. is the brainchild of Saul Wilks who, alongside his partner in crime Shaun Dangerfield, has brought us Ardour Brand. We asked him a few questions to find out, what his new project is all about. Hi Saul, it’s been a while since you and Shaun stopped Ardour. What happened and made you start a new label? What’s the story behind the new brand? Ardour was my initial foray into designing and creating clothing along with Shaun. We wrote the blog sinister delicious for a few years and it was all born out of that. If truth be told Ardour excelled at a pace we didn’t expect and we became a bit bogged down in it. Logistically it wasn’t the best as we both lived in different parts of the country and it got quite stressful at times. In the end we decided to call it a day, regrettably, but looking back it was the right thing to do as it got to the stage where it needed to be done full time and we both had other jobs and we weren’t really in the position to do that. Having said that Ardour holds a special place in my heart, as I’m sure it does for Shaun and we’re now both back doing what we love on our respective paths, which is only a good thing. After Ardour finished I knew that I wanted to do something again when the time was right, so I slowly started planning what was to become Creu. I have always had a great pride in where I’m from, that being Newport in Wales, and I wanted to incorporate that into what I was doing by taking inspiration from my surroundings, the landscapes and working class culture that I have grown up in. Newport is a traditional working class city which has a big industrial heritage, once being home to one of the busiest ports in Europe. Some might say it is an ailing town bereft of opportunity, but I don’t see it that way and Creu is my way of celebrating the home town pride that I have. What does the name „creu“ mean? Internet says it’s „cross“ in Catalan, but I guess that’s rather some welsh word, isn’t it? 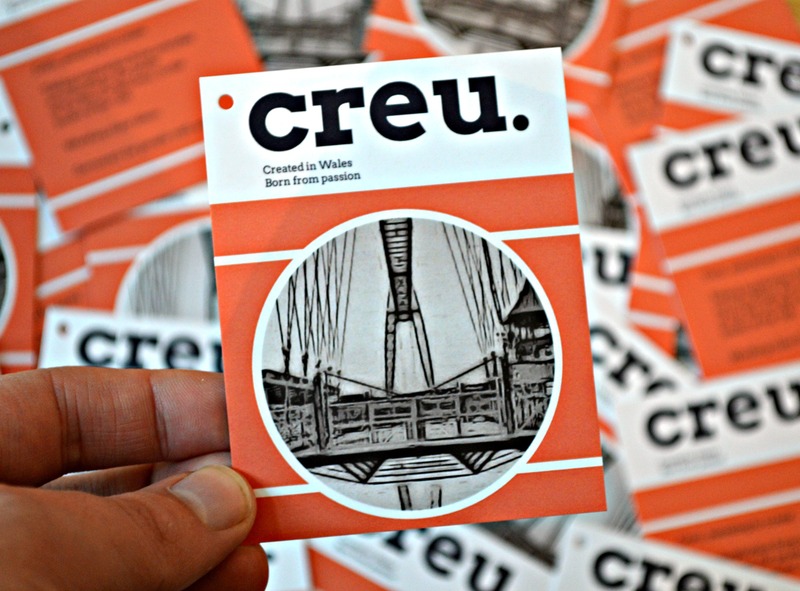 Creu is a Welsh word that means to create something. I gave the name lots of thought as I wanted it to truly represent my feelings about being Welsh and what I want to achieve. The word fuses both of those factors together and I think it’s perfect. 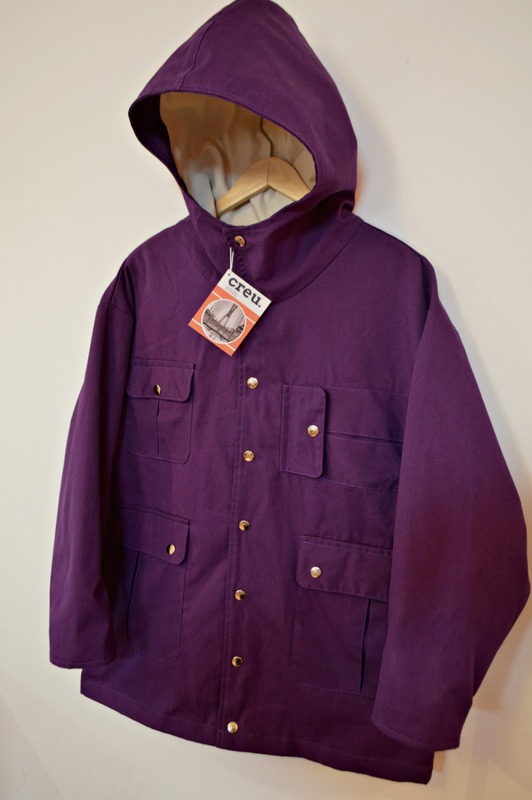 Your first item is the Somerton Parka. Can you tell us a bit about the details on this? I wanted to design something that could be worn year round, something that was functional and of course looked good. 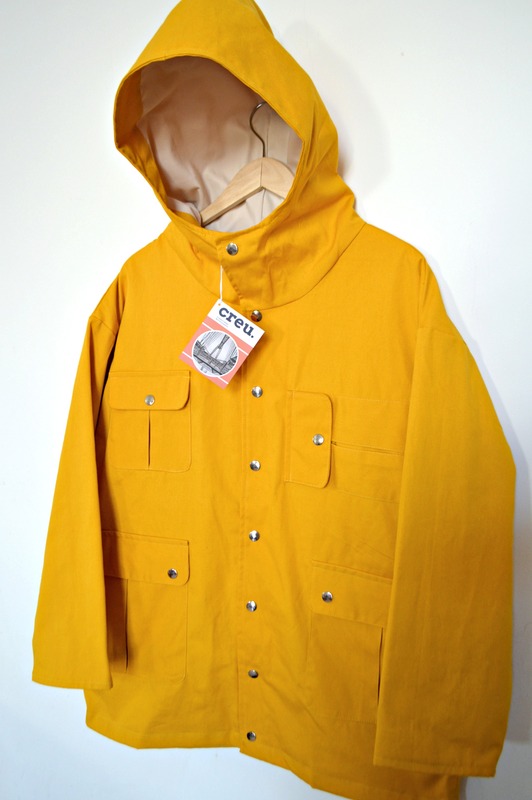 The cut is quite boxy and it’s styled off an old foul weather jacket worn on Newport docks many moons ago. To make the design more contemporary I added details such as the smart phone pocket to the chest, which is angled horizontal in comparison to the other pockets. The garment is constructed from 7oz cotton canvas, which is durable but not restricting and will keep the showers at bay. I’ve never been afraid of throwing colour into the mix so I’ve done it in a sunflower yellow and mulberry purple, which I think will look spot on in the warmer months and seems to have had a good reception on social media. It’s finished with a contrasting 60/40 lining and a nice big hood – essential for the Welsh and British climate alike. Incidentally the jacket is named after the original ground of Newport County, which was Somerton Park. The clothes you did always had a strong influence from american sportswear and the classic Ivy-Style. Is this something we will also see in upcoming stuff by your new brand? What is your main inspiration in designing clothes? I obviously loved the stuff we created with Ardour but with Creu I want to do something different. At the time both Shaun and I were very much into that Ivy style and had a big love of American sportswear and that obviously came across in the clothing we created. With Creu I take the inspiration from my surroundings and what has made me who I am. Football has always been the catalyst for my passion and love of clothes and I think that comes out in the Somerton Parka and will continue to do so with future releases. Big hoods, plenty of pockets, a nice length and cut, it’s all the things any style conscious lad looks for. In my opinion and people may argue that footwear is the most integral part of the wardrobe but deep down for me it’s always been about outwear. It’s the focal piece of any outfit and usually the most expensive. The price of clothing these days is ridiculous in my opinion and I’ve kept that in mind while making these. When you’ve got designers charging north of 5 ton for a nylon jacket that probably costs about 1/15 of that to produce it pisses me off. I’ve tried to keep it real with the pricing and will continue to do so, after all it’s mainly working class lads buying into these labels and they should be getting value for their coin. Ardour was about „hand crafted products for the modern dandy“ Who would you consider to be the typical customer for the Creu gear? I guess that would be better answered by the people who will hopefully like and buy the garments I produce, however I think it would be misguided to pigeonhole what I’m trying to do as I don’t think there should be any boundaries to style. Creu isn’t aimed at one specific demographic and it would be cool to see it worn in different ways, whether it’s football boys at the match or on a streetwear tip, style should always be a personal thing after all. Speaking of Ardour, you had some nice collaborations back then with Ebbets, BSFC and the german lads of Berlin Groundet. Are there yet some people/brands you’d like to collaborate with for your new brand? You know what, there’s so many labels I love that I would like to work with someday and therefore I could probably give you a dozen answers if not more, but I’ll try and keep it realistic. YMC would be the big one, Frazer Moss is a fellow Newportonian and someone I have always admired. You don’t get many designers from Newport so to achieve even a quota of what he has would be a dream. There’s some design classics within the YMC archives as well, stuff like the angling pack-away jacket that I lived in for a few summers, which is also a lorded classic among football circles. The houndstooth windbreaker from a good few years back as well, the only place I could find one was at a long since closed menswear store in Monmouth called Daniel Jenkins. Yeah, YMC would be a dream collaboration. I like what Rich does over at Hawkwood Mercantile, he’s a proper gent and does it for the right reasons. The style in which he does his stuff strikes a chord with me as it does a lot of people of the same disposition. Good quality materials, militaristic cuts and styles, what’s not to like? Last but definitely not least would be L.L.C. which is Shaun’s new venture. My absolute obsession with not just clothing, but records and music in general has always run, at times, scarily parallel to him. Having worked with him doing Ardour I know his knowledge and understanding of shape, cut and materials is expert. He’s a very creative person in general, so one day perhaps that would be great and it wouldn’t be out of sentiment either. I think it’s important to build Creu first though, creating and cementing your identity is so important I think when starting something like this and that’s what I aim to do first and foremost. What can we expect from Creu in the future and will the new stuff also be strictly made in britain? Everything I do with Creu will be manufactured within the UK and when possible here in Wales. I’ve always been a great believer in supporting local economy and I will strive to do that forever. You only have to travel around the local towns and valleys to see the devastation caused by the lack of investment and the out sourcing of our industries, which is also the scenario around vast areas of the country. I am proudly working class, it says it on the label and therefore I am passionate about keeping production, material sourcing and manufacturing within the UK. My stance on that will never change. I know that having a small independent label is a labour of love, but that doesn’t faze me. I want to grow the label organically, investing the proceeds of the Somerton Parka into the next garment and so on and so forth. I have not taken out any big business loans, I have had a small investment from somebody who believes in what I’m doing and I’ve also put my own money into it. It’s my dream to make something of this, in doing something that I love and is a massive part of who I am, I will take it as far as I can until I reach where I want to be. My passion knows no bounds and I hope that comes across in Creu and all the things I do under it’s banner. Adidas is working with CP Company and brings back trainers like the Forest Hills, Hip-Hop-Kids going nuts over SI as well as Supreme – do you think the „casual“/„terrace“style has become a bit too mainstream nowadays? By the way: Being a fan of the Forest Hill (as I heard) – are you going for the reissue? I think this subject is a massive point of contention for many people for different reasons. The whole driving ethos of the casual scene was to be one step ahead, looking good was paramount. Styles and fashions progress and manifest, but the term casual and its true meaning probably differs massively depending on who you talk to. I’ve been through countless looks and labels over the years, but for me the reference point was always football. Can the same be said for a lot of people buying into Stone Island and that look these days? No. Does that make it a bad thing? Of course it doesn’t. But I think a bit of context is needed. You’ve got people lording a look now that quite frankly would have been turning their noses up at it a year or two ago. The labels and looks worn by football boys over the years have undoubtedly shaped modern fashion but to me wearing those labels was never fashion, it was part of a culture that’s embedded in me and that’s the difference. The reason those labels are what they are today isn’t down to mass advertising campaigns, or celebrity hip hop artists wearing it, it’s down to working class lads who grew their own culture, who were keeping these labels going for years when very few other people knew it existed outside of an association with hooliganism. As much as people would like to rewrite history, that’s the top and bottom of it. It now has mass appeal and as such people are wiling to pay daft money for things you could pick up for about a quarter of the price a few years ago. Crack on, it all goes around in circles. As for the Forest Hills they are indeed one of my favourite ever bits of footwear and I will undoubtedly pick a pair up. Last one: If you only had the money to buy one more jacket or shoe, which one would that be? That’s a near impossible question to answer as there’s so many I can think of but for sentimental reasons I would probably be torn between the burnt orange 6876 Capandula, a jacket I have aways regretted selling as I’ve never seen it come up for sale in my size since. That or something from Mackintosh – the best outwear I’ve ever owned. As for footwear I think it’d have to be Nike Omega Flame. Thanks for the chat, Saul, and all the best for Creu.